Hello, well time for some new stamps (well last month issue actually but I only just got around to looking at these) from Hong Kong. I like these. When do I not like Hong Kong stamps!! this from the Hong Kong Post website. The family is the mainstay of society. Since the 1980s, there has been growing attention placed on family issues. The United Nations proclaimed 1994 as the International Year of the Family, and has chosen 15 May of every year as the International Day of Families, with a view to promoting the awareness of issues relating to families within the international community. 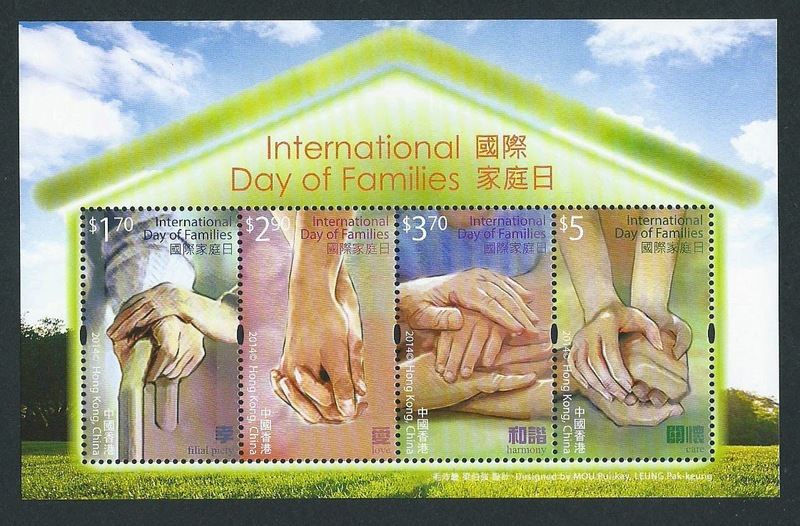 As this year marks the 20th anniversary of the International Year of the Family, Hongkong Post issues a set of special stamps on the International Day of Families to advocate the importance of upholding family values. Using a hand motif and featuring different images of hands, this set of four stamps presents the core values of a family: filial piety, love, harmony and care.